The Sports & Performing Arts Injury Clinic are part of the Össur Private Referral Patients Pathway and can fit and supply specialist Össur braces for Osteoarthritis, knee injuries or protective sports knee braces for people living in north Cumbria, to Central Scotland and the North East. Össur are a globally recognised business specialising in the use of non-invasive innovative orthopaedic solutions such as braces and supports. They strive to deliver products at the forefront of innovation, using scientifically proven designs built on forty years of knowledge, delivering clinically proven results. Products are designed to aid people’s mobility, with a reputation built on the use of scientifically-proven designs. Established in 1971 in Iceland by leading Prosthetist Össur Kristinsson the company has grown to offer market leading orthotic and prosthetic solutions, helping both the general public and athletes to achieve their goals. Team Össur plays host to a number of world renowned Paralympic athletes and Össur are proud that 7 out of 8 sprinters on the T44/T43 100m at the London 2012 Paralympic Games starting line were wearing Össur blades, with Britain’s Jonnie Peacock taking the gold medal. Össur continues to work with athletes such as Richard Whitehead, Jonnie Peacock, Jody Cundy and Scott Moorhouse as they continue to break records and set new standards for Paralympic athletes across the world. As a business, Össur continues to strive for enhancements in the areas of orthotics and prosthetics to help redefine ability for its customers, with some of the most innovative products available on the market. The Unloader One remains an innovative design to aid mobility for those suffering for osteoarthritis of the knee by offloading the pressure from the affected side of the knee to help reduce pain and provide an alternative to surgery whilst maintaining mobility. Other innovative products include the revolutionary CTi knee brace which is designed to offer both stabilisation and protection of the knee joint for those engaged in extreme sports such as wakeboarding, snowboarding and motocross. The rigid carbon fibre frame design ensures the bones remain completely aligned to prevent any instability. The Sports & Performing Arts Clinic in Cumbria provide an assessment and fitting service for the Össur Unloader One® and CTi® Custom Ligament Braces. These products require professional fitting from a clinical specialist. To arrange a consultation please contact us on 01228 586236 or if you live outside the area you can contact Össur on 0845 0064040 or email them at ukretail@ossur.com to find a specialist near you. 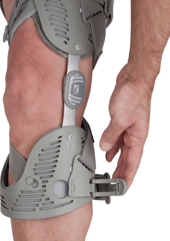 Unloader One® – Össur’s Unloader knee braces offer an effective treatment for the symptoms of osteoarthritis by unloading the side of the knee affected by osteoarthritis. 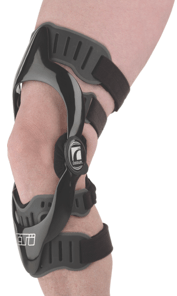 CTi® Custom Ligament Brace – CTi has set the standard for truly custom ligament bracing for more than 20 years.